Interfaith action as Abbey monastics sit with our friends from the Carmelite Sisters of Mary hermitage—and hundreds of our neighbors—to share our concerns about potential harm from the proposed Newport silicon smelter. Update: The Kalispell Tribe has created a fantastic website that summarizes all the key points and makes it easy to comment to state representatives and other officials. Find it here. The proposed Newport silicon smelter project (see our April post on this topic) has entered a new phase. Now until October 26, the Washington State Department of Ecology seeks public comments on what to include in their environmental impact assessment. You can learn more and comment here. At the same time, we’re inviting people familiar with the natural beauty and resources of our area to write directly to the Pend Oreille County Commissioners and the County Community Development Director to express concerns about the project. 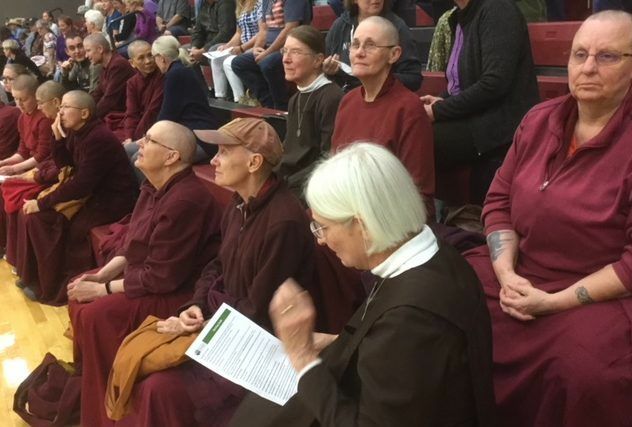 This week, Abbey monastics joined with hundreds of fellow citizens in three different public forums to speak to the Department of Ecology, sharing our questions and concerns. See the front page story in the Spokesman Review on the Spokane event. There’s coverage in the Bonner County Daily Bee on the hearing in Newport and the hearing in nearby Priest River, Idaho. Ven. Chonyi spoke about the smelter hearings in a Bodhisattva’s Breakfast Corner talk. In brief, a Canadian company—PacWest (formerly HiTestSands)—proposes to build a $325 million silicon smelter on 192 acres in our local town of Newport, Washington. The smelter facility is proposed to occupy about 70% of the property. The process requires the plant to include a 150-foot (16 story) smokestack to release smelting emissions. In the the silicon smelting process, quartz rock and carbon — in the form of coal or charcoal and wood chips — are heated to extreme temperatures—as much as 2000 degrees Celsius— in submerged electric arc furnaces. The site boundary is less than one-quarter mile from residential properties. It is close to schools, medical centers, and the Newport, WA and Oldtown, ID business districts. Preliminary modeling by PacWest consultants conclude the smelter would release 320,000 tons of carbon dioxide each year. In addition, the smelter will emit nitrogen oxides, carbon monoxide, and sulfur dioxide, which create smog and acid rain. The silicon smelting process also produces lead, cadmium, arsenic, and mercury which are released into the environment. An article in the Iceland Monitor details the experience of locals near a smaller silicon smelter in Helguvík on Iceland’s Reykjanes peninsula. Like the PacWest scenario, the owners of the smelter promised environmental protections. However, residents complain of sore throats, runny eyes, bad smells, and poor air quality. The smelter’s emissions will damage the pristine natural beauty that brings people to Pend Orville County. Visitors patronize local businesses that will suffer from the decline in tourism. The noise level of an average of ten rail cars per day and 250 vehicles day per day to a smelter, plus the noise from the smelter’s equipment and processes would destroy the quiet that attracts visitors to Newport. It may discourage people from moving to the area and encourage some residents to leave. The result is damage to the local economy. The smelter’s emissions will degrade our air quality and cause health problems for children, the elderly, and adversely affect the entire population. Blue gem coal needed for the smelting process will be brought in by rail either from Kentucky or shipped from Colombia and then by rail from a seaport to Newport. The transport of coal is hazardous and accidents are well documented. The silicon smelter will contribute to greenhouse gases, accelerating the onset of climate change. Emissions data recently disclosed in PacWest’s Draft PSD Modeling state that at least one air pollutant is expected to exceed the Prevention of Significant Deterioration major source threshold. Ecotourism holds tremendous possibilities for Pend Oreille county; a smelter will block this. PacWest is not being forthcoming with how much water the smelter needs daily, where that water will come from, and how that will affect the people and wildlife in the area. We are concerned about the project’s effect on the aquifer that area residents rely on. In addition, toxic emissions will unquestionably infiltrate the Pend Oreille River, which flows into the Columbia. PacWest states that there is the possibility of accidents and accidental spills that could be hazardous to people and environment. Pend Oreille County is on a watch list of counties in the western United States at the highest risk of exposure to dangerous levels of pollution from wildfires in the coming decades. The amount of pollution released by a fire at the silicon smelter would be disastrous for the residents of the county. Please respond to the Washington State Department of Ecology’s request for guidance on developing the Environmental Impact Assessment by October 26. You can also write to the local officials in charge of this project. It’s best if you don’t mention Sravasti Abbey in your letter. County Commissioner, PO Box 5025, Newport, WA 99156. Please blind copy the Abbey.